That’s quite a claim but I can honestly say that each time I cook rice I feel grateful that I learned this method. 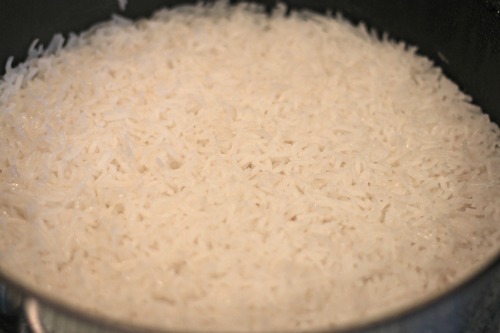 Before I would wash my rice before cooking and still get sticky rice when it was not wanted. It meant having to cool rice before being able to stir fry it and even then it wasn’t perfect. Thankfully my brother-in-law let me in on the secret of perfect steamed rice and life has never been the same again. So what is the secret? Oil. That’s all it is – a little oil, heated and stirred through the rice before cooking and you get perfect non-sticky rice every time. This method is all measured by volume which makes life very easy – it’s an all round winner. Do you have a recipe that changed your life? You will also need a wide bottomed pan with a lid and a tea towel. Bring your water to the boil and keep it boiling ready to measure when you need it. Heat the pan over a medium heat. Add the oil and let it heat through. Pour in the rice and stir for about a minute to coat it in the oil. Add your boiling water and stir once to combine. Put the lid on the pan and turn down the heat to the lowest setting on the smallest ring. When the time is up, remove from the heat and take off the lid. The surface of the rice should have little holes and be free of water. Cover with the tea towel and leave to rest for five minutes. I’m looking forward to trying this. 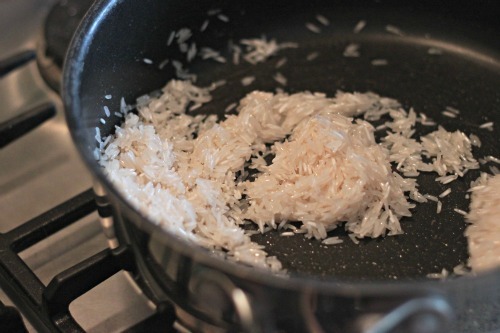 I normally just use non-stick rice but the flavour of basmati is better. I love the idea of cooking as an act of faith! I now remember that the family where I was an au pair cooked rice exactly like that (except it was butter not oil) and I loved it. Must try it myself, thanks for sharing! Any fat will work – it coats the starch which is what makes it sticky. oh my goodness Kat you have changed my life! 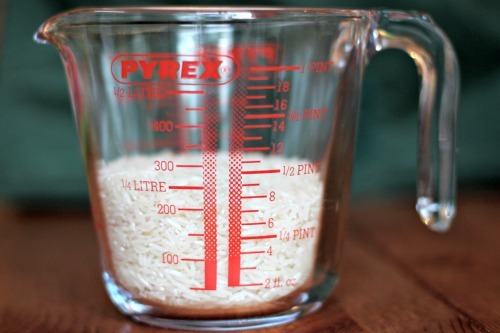 I’m notorious for burning rice or turning it into a sticky mush – so much so that my husband insists I only use boil in the bag rice now! But when this post popped up in my reader and I spied a jar of Jalfriezi in the cupboard I had to put your recipe to the test. Bloomin’ brilliant is all I’ll say. As soon as G came into the kitchen he said ”how did you do that rice” because it looked as good as your picture :o) The baby wasn’t too impressed but I think that was more to do with the really bland baby puree his was mixed with as he stared longingly at our spicy curry. .. and that’s officially the nicest blog comment thank you. I shall look forward to reading future posts now I do get some free time back from baby for reading and writing blog posts. Very happy to have found you. I have been meaning to come and comment on this post for weeks. 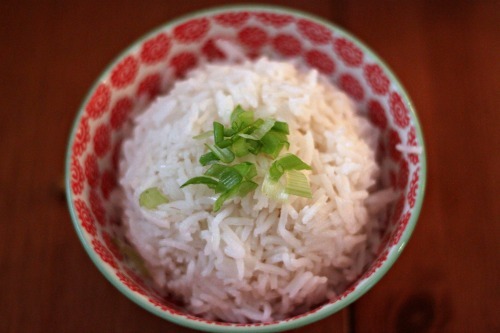 I absolutely love this way of making rice and it has turned out perfectly every time. Thank you so much for sharing.